Please refer to our stock # H050201001 when inquiring. 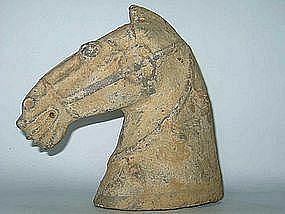 A Han Dynasty terra cotta horse head with a very animated expression. There are some traces of red pigmentation on the straps of the horse head. The horse head has abrasion , wear and tear due to the long period of burial. Otherwise it is in good condition.